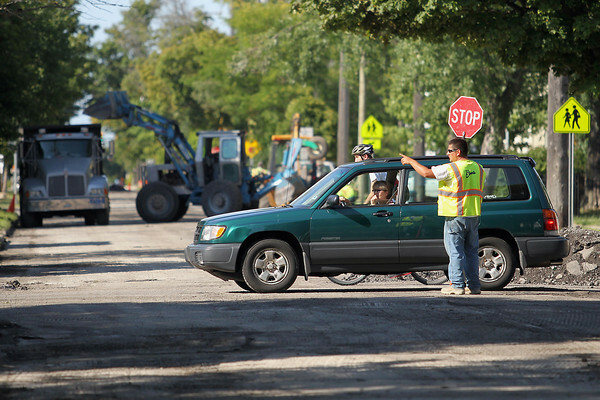 Matt Swinehart (cq) of Elmer's directs a driver on Twelfth Street across Cass Street Monday. Cass Street will be closed between Eighth and Fourteenth Streets in Traverse City for a pavement preservation project through Friday. Ninth, Tenth, Eleventh and Twelfth Streets will also be closed Thursday at their intersections with Cass Street for the paving portion of the project. The top layer of pavement will be ground off and resurfaced with about two inches of asphalt.